Agugliaro fine-tuned his management methods to turn his home service business into a $23 million dollar company in less than 10 years. I’m looking forward to sharing proven business mastery methods with the area’s entrepreneurs and business owners. Mike Agugliaro, founder of ServiceKey and co-owner of New Jersey home service business, Gold Medal Service, has partnered with the Central Jersey Business Alliance to deliver the Dinner Program keynote address. The free business community event will take place September 10 at the East Brunswick Public Library to highlight steps owners can take to better promote their business. As the keynote speaker, Agugliaro will highlight ways business owners can boost the awareness of their brand by understanding and leveraging specialized techniques in order to overcome business road blocks. As a home service industry veteran, Agugliaro fine-tuned his management methods to turn his home service business into a $23 million dollar company in less than 10 years. Joined by panel members Darr Kartychak of Intermedia Print Solutions and Michael Tesalona of Bradford & Crabtree, LLC, the Central Jersey Business Alliance dinner event will showcase ways to solve growth dilemmas and easily expand a business by 30 percent or more per year. Other topics discussed will include search engine optimization, website lead generation, and new promotional items and methods. Space is limited and reservations are required to join. The Central Jersey Business Alliance Dinner Program will be from 6 to 8 p.m. For more information, call (732) 690-5496 and to register for the free event, email WantToAttend(at)gmail(dot)com. Gold Medal Service, rated A+ by the Better Business Bureau, was founded in New Jersey in 1994 with just two employees. Their vision was to provide homeowners with a reliable and trustworthy home service company customers could count on to fix just about anything that could go wrong in a home. 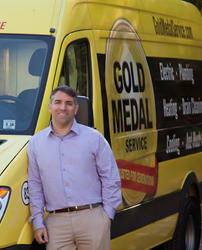 Since then, Gold Medal has grown to include more than 120 employees and technicians solving plumbing, heating, cooling, electric, drain, waterproofing, and sewer issues for homeowners across the state of New Jersey. Gold Medal Service is an Angie’s List “Super Service Award” recipient. For more information, call 800-576-GOLD or visit http://www.goldmedalservice.com. ServiceKey is a business consulting and mentoring firm, providing tested and proven methods to defeat the roadblocks that prevent small to mid-sized businesses from achieving their ultimate success. By performing a meticulous business audit, ServiceKey targets the specific areas each business needs to address, eliminate, enhance or add in order to reach their business goals and attain what every business owner wants in the end: financial independence. For more information about ServiceKey, visit http://www.secretsofbusinessmastery.com or call Mike Agugliaro at 732-513-8601.